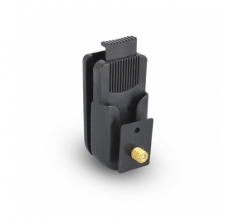 Belt Clip for Bluetherm Duo thermometer & Thermocouple ThermaData logger. The belt clip can be attached for easy access and hands free operation. The lock mechanism holds your device securely in place until the quick-release trigger is pressed whilst allowing 360° rotation of the attached instrument.